“Sweat in peacetime saves blood in war,” drill sergeants shouted to us young recruits many years ago. Maybe they still use those same words, but compulsory military service in the 1960s really meant a lot of sweat, from both physical and mental hardships. Instead of romantic adventures, my memories largely consist of loneliness and the boredom of nighttime guard duty, endless fortification work in and around camp, food hardly satisfying the stomach and horrible corporal discipline. Strangely, however, these pains when recalled invoke a faint sense of pride from having overcome the extreme conditions. The lapse of time has brought many changes to the military. The 4.3-kilogram M1 was replaced long ago by the much lighter K-2 service rifle, at 3.2 kg, and soldiers wear the shapely black beret and digitally patterned camouflage fatigues with the flap taken out of the belt, a violation of the attire rule during my time. Soldiers assigned to units on the front line can now have outings to nearby towns during evening off-duty hours like their US counterparts. Beatings and contemptuousness are strictly banned. Meal ingredients are regularly checked to ensure they provide enough calories for tough assignments. On top of all these “improvements,” soldiers spend a much shorter time in the military service now. Recruits joining the Army in June 2020 will be discharged in December 2021, as the mandatory service period will be cut back to just 18 months, one of President Moon Jae-in’s campaign pledges. Moreover, the existing defense reform plan envisions reducing the total troop strength of the three armed services to 520,000 by 2022 from the present 640,000. Judging from the speedy decline in the younger population these years, even securing this quantity of men will be a big challenge for our defense authorities in the future. They say introduction of high-performance weaponry and increasing the number of long-term service professional soldiers can fill the gap, but it is hardly reassuring to imagine fewer, less well-trained soldiers guarding the Demilitarized Zone. And there is more talk about the human rights of military personnel, probably not because more atrocities are happening in the barracks these days but because of the raised voices of activists like Im Tae-hun, who leads a private body called the Military Human Rights Center. Having served 16 months in jail himself for evading active military duty, he stirred the military by exposing the fatal hazing of a soldier by his colleagues at the 28th Infantry Division in 2014, and some cases of rights abuses by generals. He increased his profile by allying with whistleblowers in the Defense Security Command in controversy over the special outfit’s alleged preparations for martial law during the last days of President Park Geun-hye’s administration. As we observed, Im, 42, played a significant role in the exposure of the DSC fiasco, which served as an opportunity for administration leaders to launch an extensive reshuffle in the higher command. President Moon named a retired Navy admiral his defense minister, a position usually reserved for Army generals. Song Young-moo, the 20th defense chief since the democratic reform of 1987, was replaced after 13 months in office, during which he did little to increase public trust in the military at a time of a highly volatile security situation or establish firm discipline in the officers community. Deplorable disarray in the command environment was dramatically shown to the public when Minister Song and senior officers of the MSC labeled each other liars during a hearing on the martial law controversy at a National Assembly standing committee broadcast live. TV viewers wonder if they are really protected by a military whose members in the upper and lower echelons are ready to die for the nation, executing orders from above. Emphasis on the human rights of military personnel is a just development. However, it is regrettable that the military’s own negligence in the protection of soldiers’ human rights invited interference by an outside activist who himself refused to bear arms. All in the military should share the shame. The recent 2018 Asian Games in Indonesia touched off new debates on the appropriateness of exempting young men who emerge champions at international competitions from active military duty. There definitely is a need to review the decades-old system of special exemptions that was a product of a time when Korea was thirsty for international recognition and when long military service could mean the ruin of a rising career for men of exceptional talents. This is a difficult time and the government should demonstrate its resolute stand on national security with actions like abolishing the service exemption system. Fundamental questions are being raised about the present administration’s basic stance toward North Korea. Where do our leaders stand between recognizing the North as our primary enemy and regarding it as a neighbor with which we should pursue co-prosperity and eventual reunification, or where between these? In the Defense White Paper, the annual report on the nation’s defense ideology, posture and capabilities, North Korea is no longer called the “main enemy.” Whether main enemy or not, North Korea remains an anti-state organization that operates within the Republic of Korea territory that encompasses the entire Korean Peninsula. Until and unless the current denuclearization process is completed, there is absolutely no reason we should modify our defense posture and the shape of the military alliance with the United States. But a sense of transition pervades both the civilian and military communities concerning our security environment with the emergence of the multilateral process of North Korean denuclearization. The undeniable facts are that our soldiers’ individual combat capabilities are declining while high-ranking officers are subservient to political power rather than resolutely maintaining independence from it with professionalism. We are deeply sorry there is no voice of opposition from our generals against the absurd government plan to shorten the compulsory service period despite the foreseen decline in the youth population, while they know too well the damage it will do to our defense posture. Our defenders nowadays save a lot of sweat in their service life. My drill sergeants were right in their warning against an easy military life. Our government and military authorities, please do everything to ensure that not much youthful blood is shed in a time of real fighting. 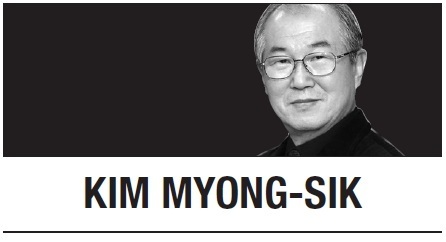 Kim Myong-sik is a former editorial writer for The Korea Herald, -- Ed.